Lindsay Holliday for reviewing the text prior to publication. Ice Age mammoth hunters, archaic hunter-gatherers, woodland horticulturists, and Mississippian temple and burial-mound builders left a continuous, still-visible cultural record in the earth of the Ocmulgee Old Fields. After the English constructed a trading post at Ocmulgee in 1690, the descendants of these native Muscogee people were called Creeks. In 1805, when the Muscogee ceded their lands between the Oconee and Ocmulgee rivers, they refused to part with the Ocmulgee Old Fields Reserve. They returned here to camp and trade until they were forced out of Georgia in the 1820s and ’30s and exiled to Oklahoma, where the Muscogee Nation is currently located. In 1843, the line for one of Georgia’s first railroads cut through Ocmulgee’s great Macon Plateau site and another went through in 1874. Finally, in 1934, 2,000 acres of the Old Fields were designated by Congress to be protected as a National Monument. However, funds to purchase the land were not provided, and currently the park is comprised of only 702 acres. The current highway debates began in the 1960s when I-16 cut off the monument from the Ocmulgee River, which bounds the park on the west. Highway construction destroyed burials and numerous ancestral sites sacred to descendents of the original inhabitants. Since then, the Swift Creek mound complex and a number of other important sites within the Ocmulgee Old Fields have been destroyed. An area of the Ocmulgee Old Fields, larger than the current national monument, was designated a Traditional Cultural Property District in 1997 and listed on the National Register of Historic Places. Three hundred acres of land donated in 1992 is being held by the Archaeological Conservancy until it can legally be incorporated into the national monument. The Georgia Department of Transportation (GDOT) has proposed building the Eisenhower Parkway Extension through the Ocmulgee Old Fields wetlands between the Macon Plateau and Lamar Village units of Ocmulgee National Monument. Its cloverleaf interchange with I-16 would partially sit on the Scott-McCall Archaeological Preserve. This $130 million, less-than-four-mile-long highway is the department’s preferred cross-Macon connector for the Fall Line Freeway, which runs northeast-southwest between Augusta and Columbus. City officials and business leaders argue that the Macon area needs the economic boost that would stem from development around the freeway interchange. The Muscogee (Creek) National Council has formally opposed this route, which is also opposed by organizations including the National Parks Conservation Association, the Archaeological Conservancy, the National Trust for Historic Preservation, the Sierra Club, and the Georgia Center for Law in the Public Interest. In addition to cultural destruction, there are also many concerns relating to the destruction of wetlands and wildlife habitats. Because of the highway’s interchange with I-16 and its effects on nationally significant cultural and natural resources, federal funds cannot be used for this project unless the GDOT can convince the Federal Highway Administration that there is no “prudent and feasible” alternative. Of over a dozen possible routes, the U.S. Department of Transportation considers the Fall Line route to be the most expensive and harmful to cultural and natural resources. Consequently, the GDOT’s first draft environmental impact study was rejected by the Highway Administration. The Georgia Department of Transportation has yet to issue a revised version of this document and the FHA continues to hold the funds. Posing a further threat, the Army Corps of Engineers may grant a permit to a local brick company to stripmine 600 acres of land within the floodplain of the Old Fields Traditional Cultural Property district — 300 acres of which are wetlands. This would entail new road construction and endanger certain archaeological sites, forests, and water quality. Of the nine newly discovered sites in this area — including mounds, dwellings, and workshops — three of them would be destroyed under the plan proposed by the Cherokee Brick and Tile Company. Burial grounds may exist in the vicinity of the dwellings, which has the Muscogee concerned about the Corps’ ruling. The Ocmulgee situation is a perfect example of the need to not just protect a site but an entire area that is culturally, spiritually and environmentally interdependent. Some parkway advocates propose small buffer areas between the highway and the mounds, which reveals a blindness to the need to preserve the integrity of sacred lands. Ocmulgee Old Fields was the first Traditional Cultural Property District to be designated east of the Mississippi and represents a rare acknowledgement of the presence of these historic native village areas in the eastern United States. While it has not remained entirely intact over the centuries, much of the complex is still undeveloped, which gives the federal government a chance to implement long-overdue protections of culturally significant places. The national monument should be expanded and not diminished further. The National Parks Conservation Association also points to the lack of funds provided by the Park Service to care the artifacts and curate visitors’ exhibits. The Muscogee (Creek) people, concerned organizations, and individuals have reviewed alternate routes for the cross-Macon connector for the Fall Line Freeway. The least destructive and expensive solution would be for it to stay on I-75 to I-16, and continue on the four-lane Emery Highway to Highway 57 (Fall Line Freeway North). This existing route is only 1.5 miles further and saves a vast amount of public funds. The Georgia Department of Transportation and Macon politicians should be encouraged to adopt these alternate routes. In the meantime, legislation is needed to incorporate the private land donated in 1992 into the national monument and to expand the monument to include the full 2,000 acres originally delineated in 1934, as well as additional land in the Traditional Cultural Property District. The area’s proximity to Macon means that it will be constantly threatened by development if not protected now. Insist that the Eisenhower Parkway Extension/Fall Line Freeway be subject to Section 4(F) of the Department of Transportation Act, which requires Georgia Department of Transportation to demonstrate that there are no feasible, prudent alternatives to the proposed route. When it does finally issue the environmental impact statement, be ready to comment. To get more involved, contact Friends of Ocmulgee Old Fields. Duncan, S. Heather. “Sites of Ancient Culture in Macon Ga., Could Be Destroyed in Firm’s Expansion.” Macon Telegraph, November 5, 2003. National Park Service. 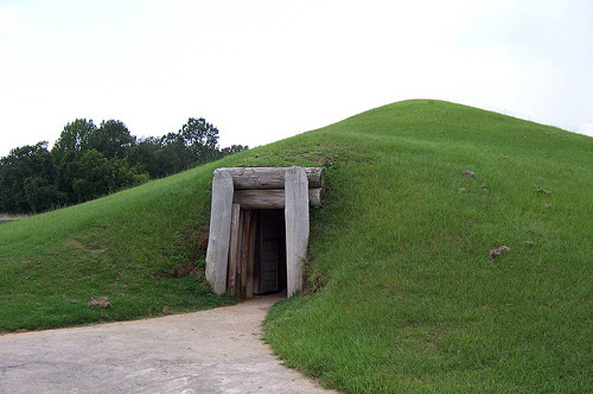 “Ocmulgee National Monument.” U.S. National Park Service. National Parks Conservation Association. “Ocmulgee National Monument.” National Parks Conservation Association. Quinn, Christopher. “Mounds of Controversy: Is Sacred Tribal Land in the Path of Progress.” Atlanta Journal-Constitution, April 14, 2002. Schwarzen, Christopher. “Monument in Danger, Group Says.” Macon Telegraph, March 25, 2002.